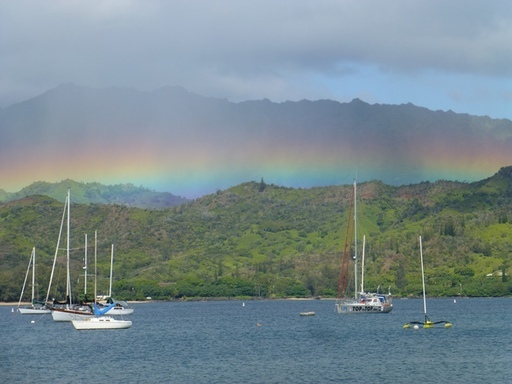 See Nic's video from the passage Hawaii - Aleutien here! 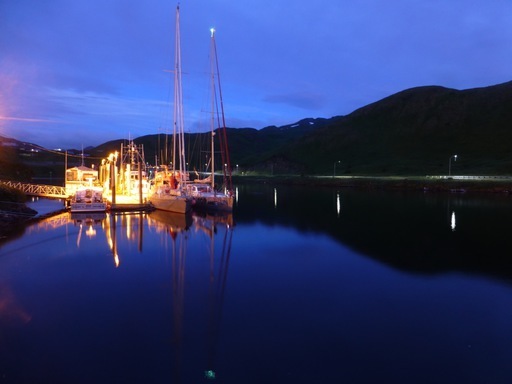 Press Release Dutch Harbor, download here! On 27-07-2013 we depart Kauai for Alaska. After a last clean-up at the Hanalei beach we met per chance Terry Lilley, a marine biologist. While he films underwater movies, he explores the north shore reef of Kauai and his habitations. Doing this he has discovered four news species. 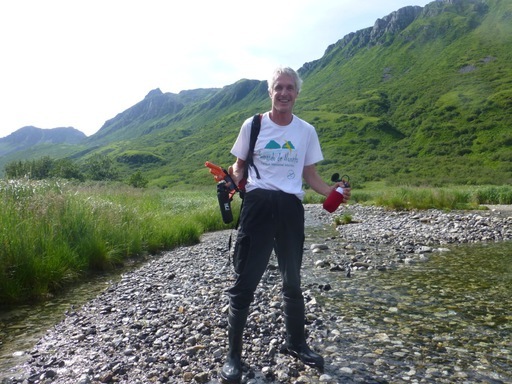 His goal is to create a model of a worldwide reef protection. Unfortunately it was only a short meeting because he had to leave for Honolulu, where he had an interview. Salina wants to go back and do some underwater movies. 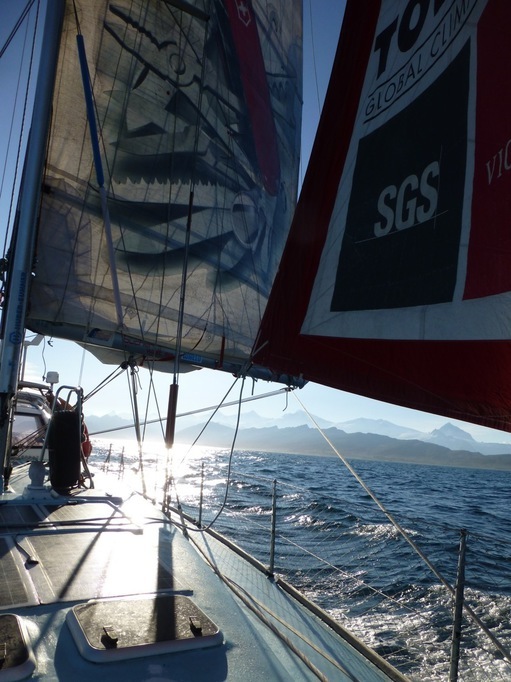 With the passage wind (20-25 KN, north east wind) we sailed off in direction North West. A last rainbow said good bye. 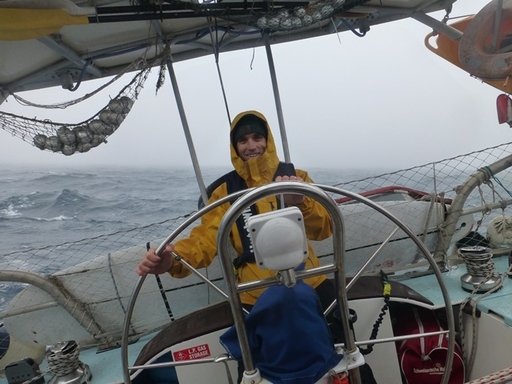 The north pacific is characterized by a high pressure between 40-50° N and 150° W -170° E. Our goal is to sail on the west side around this high pressure, marked by less wind and to reach the west winds in the north for sailing back to the Aleutian Islands. This summer Alaska knows a heat wave and so this high pressure is even more pronounced. Once we have passed 40°N the wind turns to south and drop down. We used this time window to fix some damage on Pachamama. 5 o'clock in the morning, the best moment without waves to put Dario up the mast for fixing our front sail and the forestay. 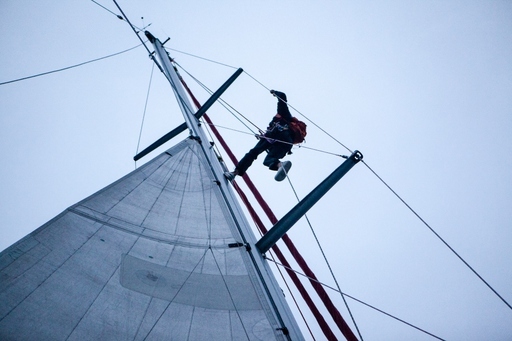 Even with the small waves Dario did some acrobatic exercises on the top of the mast. After the hard work, Dario is again on board, Sabine discovered water in one of the front bathrooms. 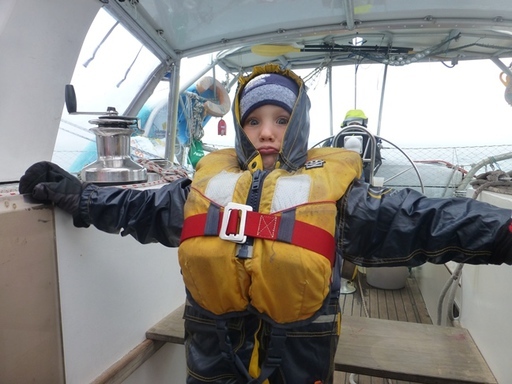 The kids shouted already that there is a leak in the boat and that we were sinking. A 'through hall' was damaged and we had to exchange it, avoiding too much water entering the boat. Quite a challenge on a passage like this... At lunchtime everybody was tired but happy that everything was fixed. Now we had deserved shower. The nights were getting cold. The kids got their gloves, beanie and boots. The adults took out their warm sleeping bags. The high pressure forced us to go further west to find some wind. Past the high pressure the water temperature dropped down to 3.4°. Our heating did still not work, even we ordered spare parts for US 500.-. Dario is missing one switch for it. 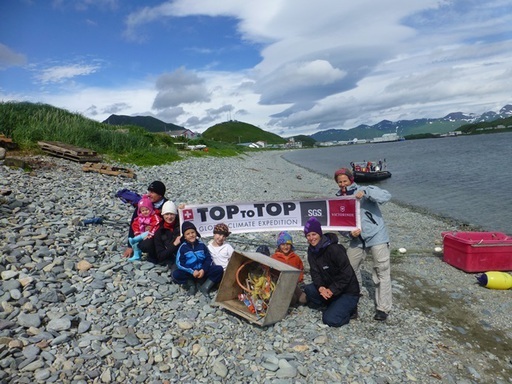 We hope TOPtoTOP member Nikolai can bring it to Kodiak from Switzerland? On the north side of the high pressure, the wind was more unstable because we are in the weather kitchen of the north pacific. With each west front we got wind about 20-25kn NE. Dario was quite busy to study the weather data which changed every 2 hours. 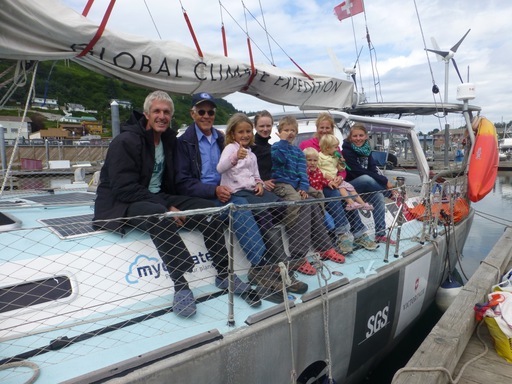 Thanks to Jan Hafner, Fred (from SY Songline) and Eric (from SY Sarana) who provided us with great weather information. 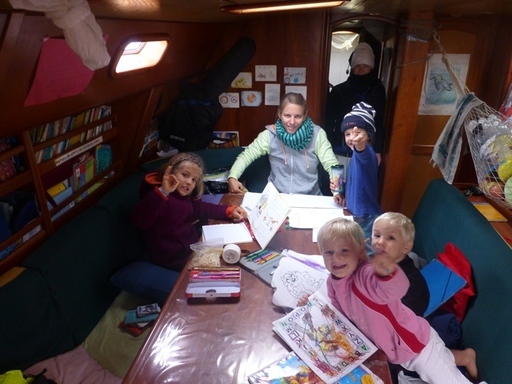 Life on the boat is marked by the rhythm of the shifts and the kids. Nic, Christina und I had four two-hour shifts. Sabine looks for the food sometimes with help from Noe and Alegra, Dario for the navigation and repairs and with Sabine for maneuvers and reefing. Salina and Andri have school in the morning with Christina while Sabine and Dario tell some history to Alegra and Noe or draw with them. After lunch there is homework to do and Nic teaches them in science and English. In the evening Sabine teaches Salina and Andri to play recorder. Nic was filming the life on board. You will see it soon. 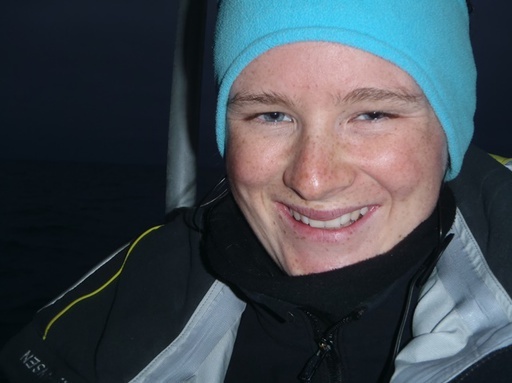 Nicole was responsible for the water samples to study the radioactivity in the North Pacific from the nuclear disaster and to watch for debris in the ocean. Our water sample installation needs some modification for well working. The end of our passage we are occupied with the preparation for the arrive in Alaska. The wind was tricky and so too the decision where to reach the land. Finally we decided to do some detour for Dutch Harbor where Nic can go off from Pachamama and fly back to Australia. 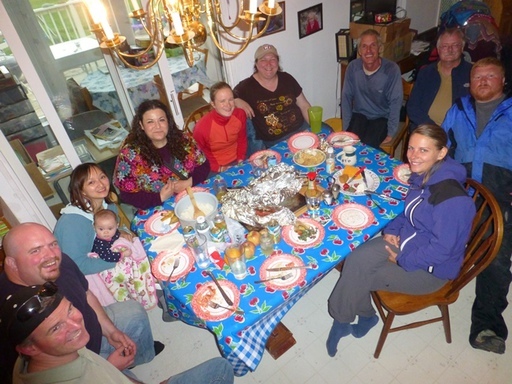 Thanks to Jill Fredston (from SY Companiera) we are already able to plan the cycling to Denali. After 16 days on sea, we are for anger in a bay without name. So Dario decided to give her the name Sabine Bay (N 35.45.475 W 166.22.475). The green island with the fjords and snow is very impressive after the last days dominated by the blue color. After a short morning sail through a small passage with a lot of current, we are now in Dutch Harbor, back in the civilization. 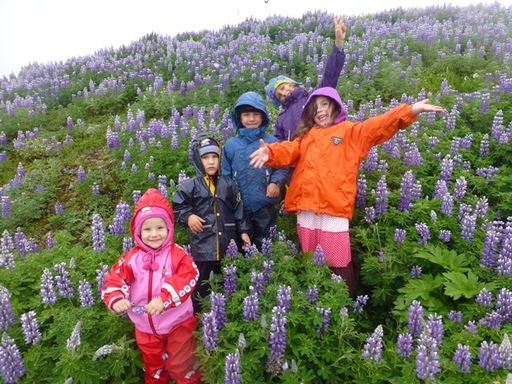 Everybody is happy to be in Alaska! We found our place in the bobby's storrs international small boat harbor. But there are 3 harbors more for the big containerships from Asia and the mainland. 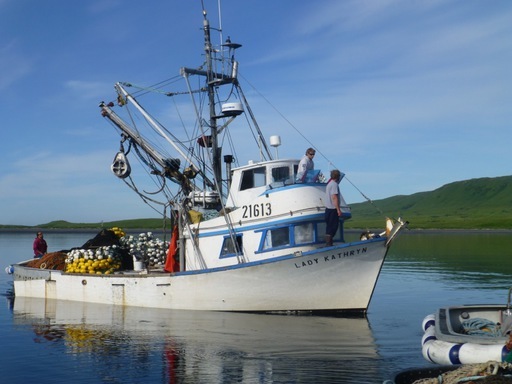 It's an important harbor because it's located at the confluence of the Pacific Ocean and the Bering Sea, one of the world's richest fisheries and it's the only natural deep water port in the Aleutians. In 2007, Dutch Harbor shot into the limelight when "The deadliest catch" emerged as a popular reality show on TV. We were curious why it is so popular to come here for work if the climate conditions were so hard. The answer was every time the same, for money. 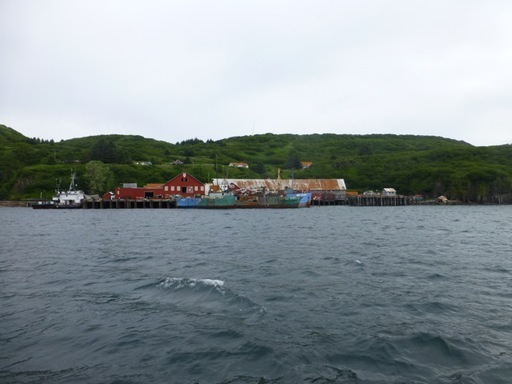 From all over the world, fishermen are coming to Dutch Harbor to earn a lot of money and send it home to their families. So here aren't a lot of women. We could see it in the cloths stores, where only men cloths are sold. While we were waiting that the fishes swim in the net, we did a clean-up on the beach . After 2,5h we caught 19 salmons - 4 red, 14 pink and one king salmon! 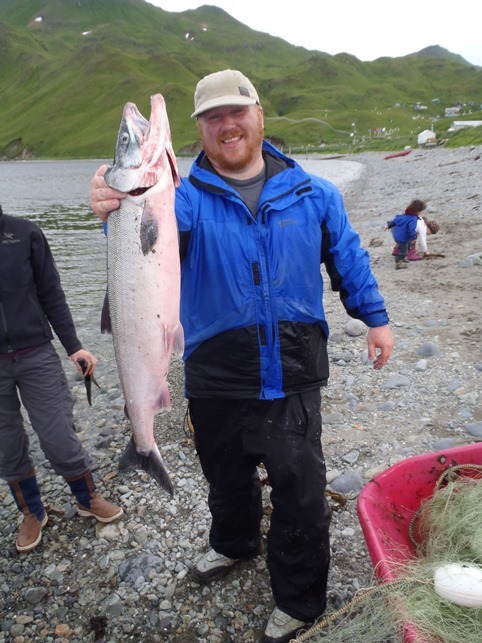 To catch a king salmon is quite difficult. For Cooper it was the second one in this season. You could sell them in a store for 2500 dollars! But the license permit only to catch for the own use. So we will have a lot of smoked salmon for the sail to Kodiak. 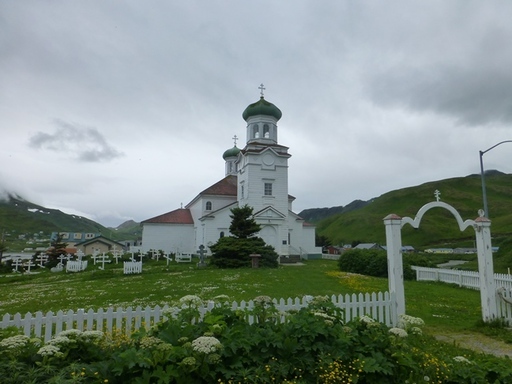 In Unalaska - 3580 peoples but the most of them weren't living the hole year here- with a great view over the Iliuliuk bay, is placed the oldest Russian orthodox church in Alaska. It was built in 1825 during the Unangan occupation. Today, the church gives the opportunity to document their own history and so the church contains almost 700 pieces of art. Cooper gave Christina and me a lesson how to prepare the salmon for smoke. 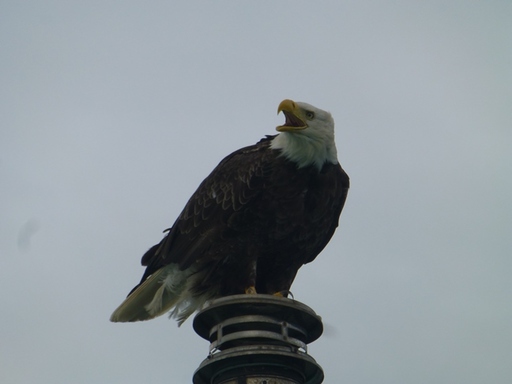 During our work we saw a great spectacle, a seal and five eagles were hunting fish in the harbor. 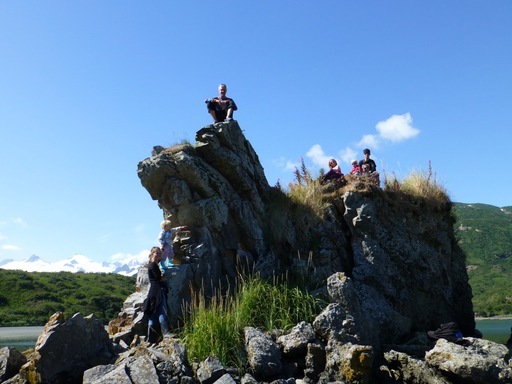 Our trip along the Aleutian Island, continue at midnight. Thanks a lot for the nice journey to Dutch Harbor. We appreciated it a lot and we look forward to see you again in 2015. 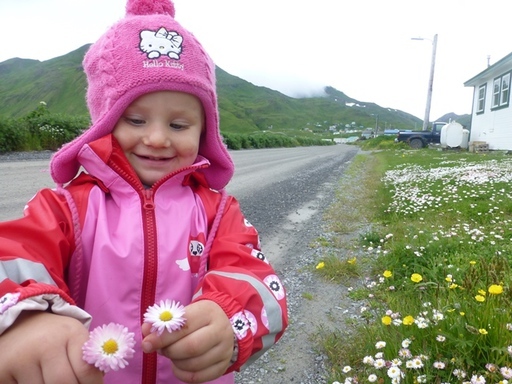 Dario thinks to overwinter in Dutch Harbor in two years. Robe drove us over a pass to the summer bay, so that we could see something more than the village from this beautiful island. The impact of the WWII is still visible in Dutch Harbor. Everywhere the pillboxes and bunkers remind at the WWII. In 1938 U.S. military decided to construct the main naval base and an air station. 3rd June 1942 the Japanese attacked the Aleutian Islands. Their mission was to neutralize the air base and destroy its ability to attack Japan. The native Unangan people were evacuated from the entire chain. The Japanese had occupied two islands on the western end of the chain, Attu and Kiska. In 1943, the Americans reconquered the islands. 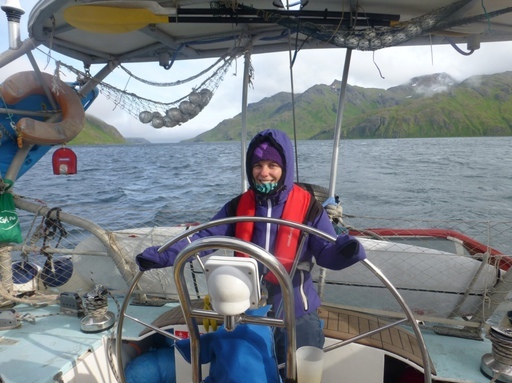 Passing the Akutan pass in direction to Sand Point, the high waves prevent to sail fast as expect. So we anchored in Unga. But except of some remote houses there was not so much in the bay. Unfortunately the fog block the view of the islands. In Chignik we tried to go in the harbor but the wind (45kn) which blows through the valleys and around the caps prevent to go on land. Chignik was like a boarder in two ways. Around Chignik, it was the first time that 3 humpback whales followed us and since then we could see their flukes again and again. And we enjoyed the sun and warm temperature. In the night we saw for the first time star sky and full moon. Now, sailing along the islands is beautiful. 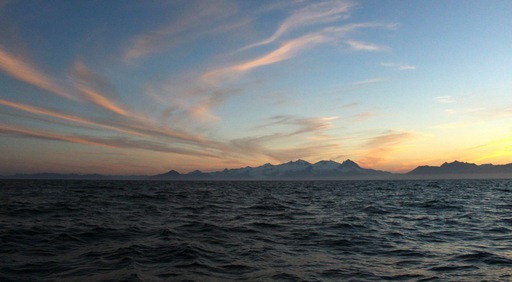 The Alaska Range keeps marching southwest to merge with the Aleutian Range and form the vertebrae of the Alaska Peninsula, Alaska's rugged arm that reaches out for the Aleutian Islands. We can find here the most active volcanoes. 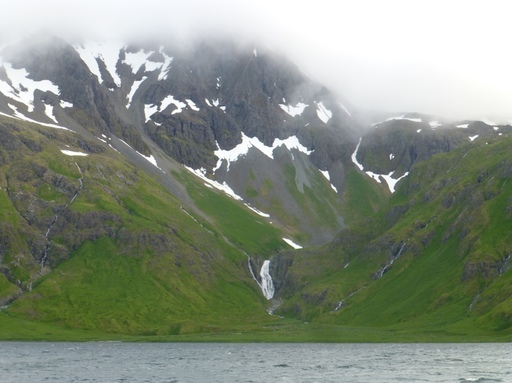 The highest was on the Unalaska Island. Dario looks forward to climb it. The next stop was Kodiak Island. 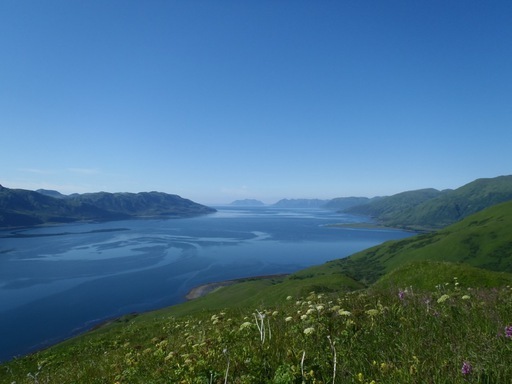 Kodiak is the second largest island in the U.S. after Big Island of Hawaii. 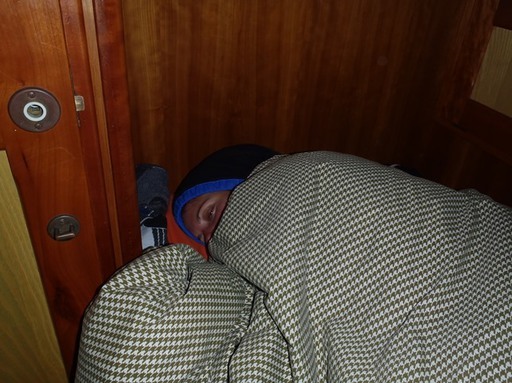 In Kaguyak bay we slept the first time next to 4 fishing vessels. They worked with Victorinox knifes and one fisherman told us that the night before he married, he dreamed that he cut the umbilical core of this baby with a Victorinox knife. But the doctor didn't allow it. He was a bit jealous when Sabine told him that Dario did so. 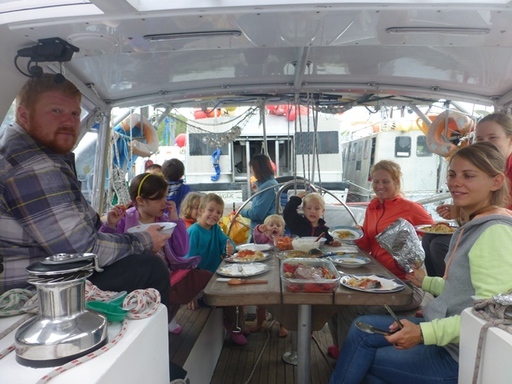 For lunch we anchored in Three Saints bay. The valley looks like Switzerland if the water would flow the land until 2000m over sea. We dare to go on land even if there were a lots of bears on this island. Dario toke the pistol, pepper spray and a horn for protection. Luckily we didn't cross one but we saw the bear mark on the floor. 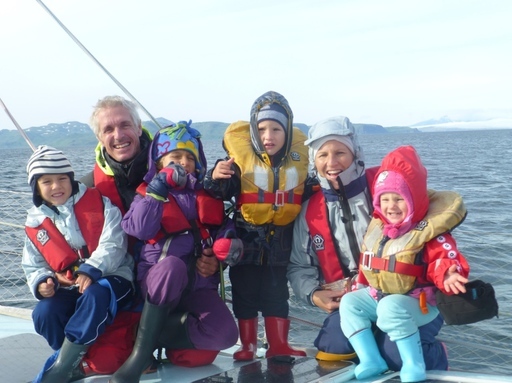 In the fjords it's difficult to sail and there was also no wind, so we went under motor to Old Harbor. 200 people live in this fisher village. 1964 North America's worst earthquake took place. The tsunami destroyed many villages, also the two villages we visited have been destroyed. Old Harbor was reconstructed and a lot of natives from the other villages moved here. This lovely place is only accessible by airplane or vessel. The Orthodox Church caught our view. The most natives were orthodox. The native language (Aleutiiq) was influenced by Russian, when the islands belonged to Russia. Even today, the people use Russian words for the things, which don't have a name in the aleutiiq language. In the afternoon we hiked for collecting strawberry and raspberry. These were two beautiful days, which is very rare in this season and region. 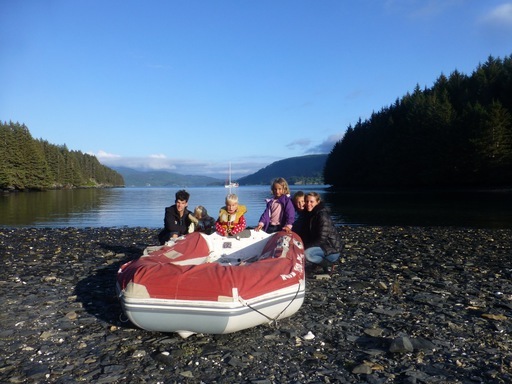 In Kodiak there is a crew change. I leave the boat and Nikolai comes. Report coming soon. Check already the pictures here! On the 27th of July we had to say goodbye to Nicole. She has been on the boat for two months and we could not avoid some tears while saying goodbye. 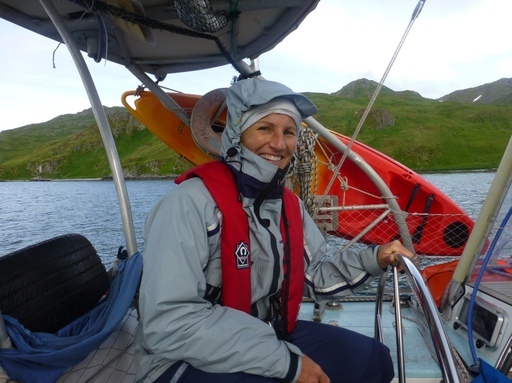 In Kodiak we had the chance to have a very generous harbormaster. He and his wife gave us a lot of vegetables, which we had not eaten for weeks. Thanks a lot! 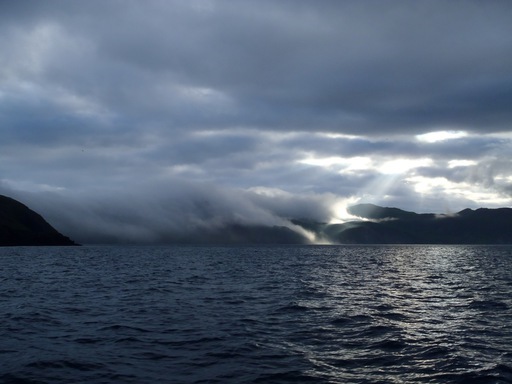 Then we left Kodiak and hissed sails for Geographic Harbor. 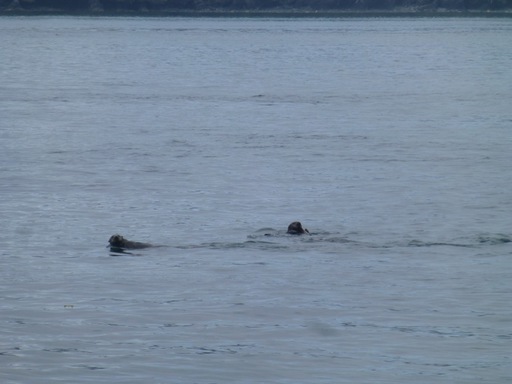 On this way we went through the "whale passage", where we did not see any whales but a lot of river otters. We could observe these funny animals several times. It seemed that they were enjoying the nice weather as much as we are enjoying it. 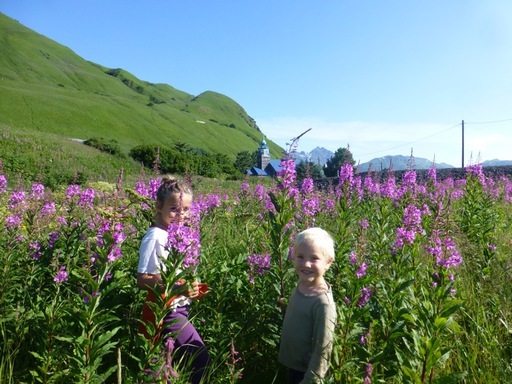 Some Alaskan people told us, that this is the best summer they had since thirty years. On the half way to Geographic Harbor we stopped and anchored in a nice bay called Bare Island. The kids had fun to explore the near island but we did not see any bears yet. The next day we continued westward to Geographic Harbor. 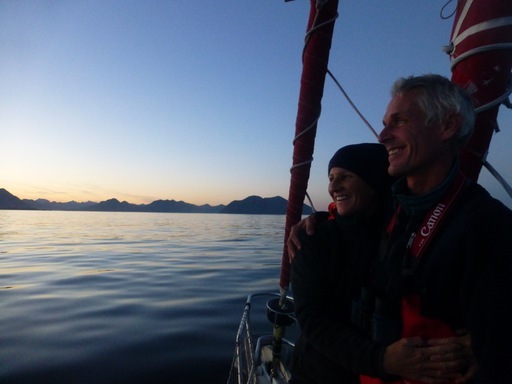 This is a lovely place on the Alaska Peninsula where we met the first yacht after Hawaii: SY Patago from France with Alain and Sophie on board. 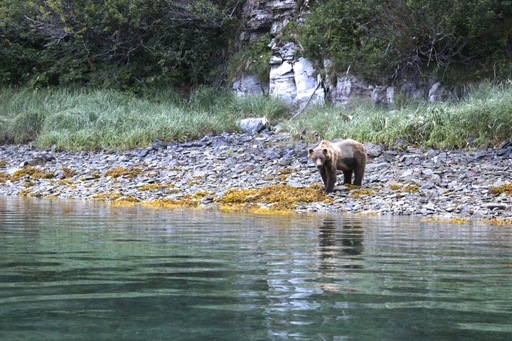 The next day they we took the tender for another trip and in another bay we saw four more bears. We even could observe one fishing salmon. In the later afternoon we left geographic harbor and were happy, that we could see so many bears! The next destination was Seldovia. On the way we anchored one more time in Devils Cove with huge glaciers in the background and it was obvious that they are retreating fast. We walked along the shore but had no luck to see bears. After we had dinner we continued to Seldovia. 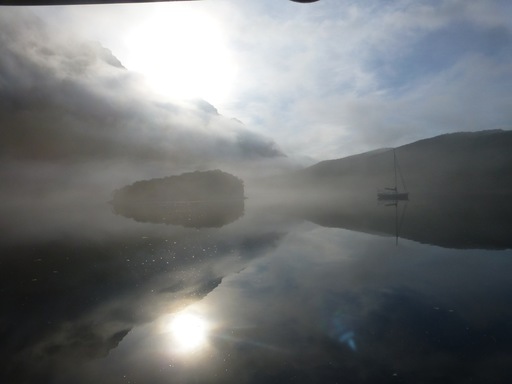 This can be a quiet tricky passage over Cooks Inlet. 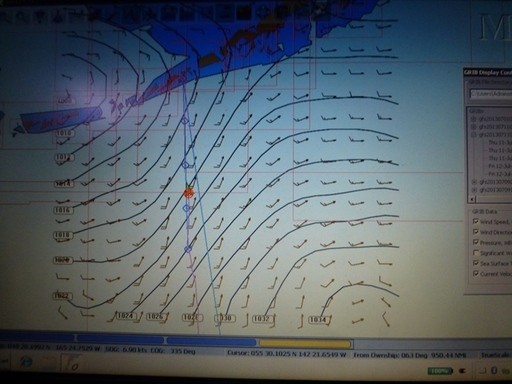 We had very good wind and did the 120 nm in 15 hours; 3 waves made it all over the boat from bow to stern. Seldovia is a nice little village with about 250 people. They even have a playground here, which of course was a big sensation for Salina, Andri, Noe and Allegra. They already found friends here and enjoy playing with them. "At 9:15 this morning of 27 July 2013 in Bad Salzhausen, German, Dominique closed her eyes, spread her wings and departed. Please take all the energy, prayer and focus you've been sending her for healing and release it in joy for the wonderful life she has led and focus it on the transition she must now make to that which is next..."